You know when all the stress in the world just builds up and jumps up on you? You’re not even sure why or what it is exactly that’s causing you to teeter precariously on the edge of a breakdown. And you sit there with your mind racing; Your heart racing; trying to figure out what to do next. – I’ve made them with 2 tbsp peanut flour (aka pb2) and they’re SO AMAZING, and even more filling – even if you don’t like peanut butter, you cant actually taste it that much. -You can use frozen bananas for this, just let them defrost and then peel and use as per usual in the recipe. 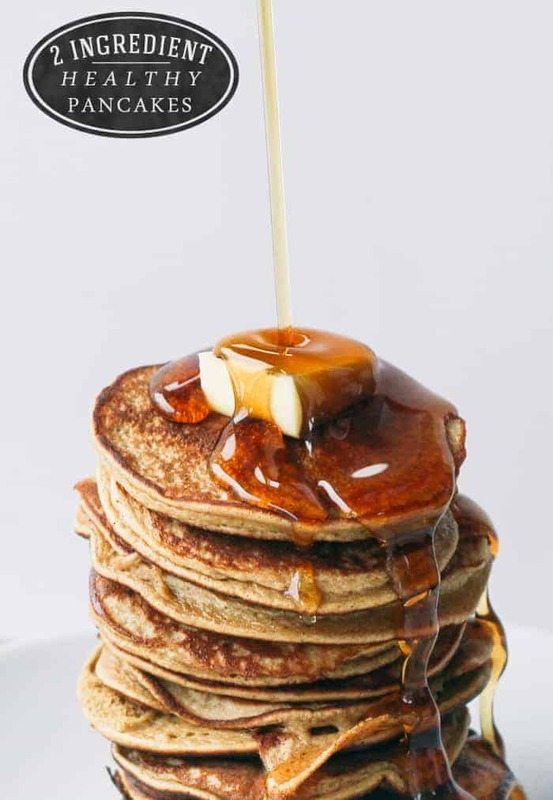 – the recipe is adapted from various places around the internet (just google ‘2 ingredient pancakes’.. you’ll see how many people have made them!) Update! : I think I’ve found the source of the recipe, Blogilates! Peel and mash the banana, stir in the egg. Mix in any non-chunky add ins that you want (e.g. nut flours or butters, baking powder...). Heat a non stick skillet and lightly spray with oil. Tun the heat down to medium-low. Pour a circle of batter into the pan (I used about 1 or 2 tbsp of batter per pancake). Cook until golden brown on the underside (around 1 minute) sprinkle on any chunky ingredients (e.g. chocolate chips, fruit, nuts, if using), then use a metal spatula to flip and cook until golden brown on the other side (30 seconds to 1 minute). So you weren’t joking when you said 2 ingredients! They look amazing, best gif ever. They actually do taste delish without any of the additives… but I do put in the baking soda and cinnamon and vanilla. Then the cinnamon and vanilla are good in the ‘bready’ variety of pancakes too! 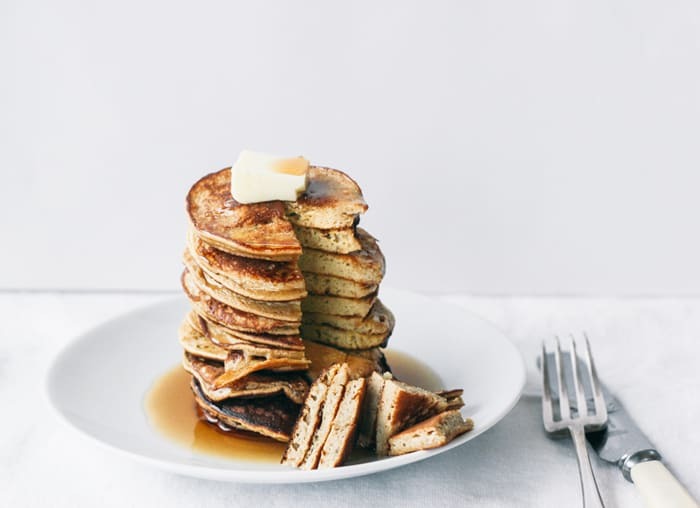 I’ve been dying to want to try these out, but somehow I haven’t managed… even though the whole Internet (and especially all the health/fitness/healthy food blogs I read) is all about banana pancakes! After seeing your amazing pictures and the “motion picture”, now I have no choice but to go to the food store and buy some bananas. I already have some eggs. And why not to throw in some dark chocolate as well. A little dark chocolate in a pancake has never hurted anyone, right? Me too! I had been waiting for the right opportunity, and just had a spontaneous photo shoot with them this morning (which is why the whole set up is really plain). This is the reason why healthy things are made, so we can put bacon on them. That needs to be on a t-shirt! This is such a brilliant idea! I have to try this one out. Your gifs are always amazing but I do love this one. These photos are just perfect, I am dying to dig into those pancakes. Hi, these look unreal! Beautiful pictures, wow. With the PB2 optional add in, do you mix the pb2 powder with the recommended amount of water before you add or just add in the powder to the banana/egg mixture? Two ingredient healthy, fluffy pancake + super cute gifs = you are a magician!! I swear, I learn something new about food every day reading food blogs lol, amazing recipe and cute gif!! no way! These are awesome. Love the photos. Such a talent! Droooooool! Stunning photos and now I want pancakes for breakfast!!! plus it’s gluten free!! Also super in love with your animated Gif! I was really craving pancakes this morning so i was very happy to find your recipe for a healthier version of it. Thanks for all the tips and notes, they were better than regular pancakes; fluffy and tasty. No way! Seems too good to be true! This will be breakfast tomorrow! dude, that gif is like the single best thing on the internet, no lie. I’m so glad I happened upon this recipe today- my son and I tried it out this AM and we were surprised how delicious it was! My kiddo (11) has his own food blog- RecipeBoy.com, so he’ll be sharing his version of this on his site w/ a link to you for inspiration. Thank you! That is the best GIF I’ve ever seen. These look amazing. Those look so good! and healthy too which is always a bonus for breakfast! I recently made these amazing Honey Mustard Maple Chicken Skewers, they tasted so amazing. I’ve just spent the morning reading through your blog. It’s just amazing. These pancakes look gorgeous and I can’t believe they are healthy! I just made it, taste is really good. 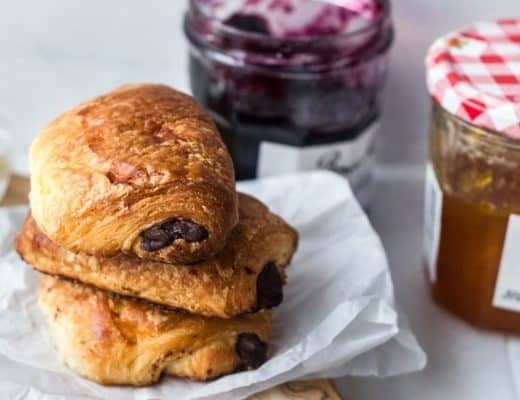 Made with cardamom, raisins, maple syrup, candiend orange peel and sugar free cranberry jam – very good. Should’ve seen this before I smashed the $5000 HD TV to bits…just kidding! (I can’t afford an HD TV. #poorcollegestudents) These pancakes, though, I can definitely afford. Good thing I just bought Trader Joe’s syrup! Real maple syrup = liquid gold. Have eggs have bananas … just waiting for the sun to rise…… it’s almost 5am…… those pancakes are making me salivate. First of all….wow, I love your blog! Your photos are very impressive. I also can’t believe these pancakes only have 2 ingredients in!! I have a banana in the freezer that I was intending to make banana bread with, but I may just try out these pancakes instead…! These look wonderful!! Any idea how many calories these might have? Thanks! It’s around 225 kcal for the whole recipe (using 1/2 cup of mashed banana with 2 eggs – no extras) – but believe me, it makes a lot of batter and is really filling! Oh girl, that gif is yummy. I love the ol’ one ingredient banana ice cream (although I add coconut milk to mine), but I wonder if this recipe would work in a waffle iron too? It looks just like a pancake, but what’s the consistency like? Is it wet inside? these look absolutely divine! have to make them now. this is what i want for dinner! Joy the baker sent me here-new follower! I just made these – they are so good! Oh my your blog is so goodlooking and you have so much talent I want to cry. And stop blogging. I’m not a frequent poster on blogs but ho shii your blog is super fantastic!! I love the gif images, the word I want to use for them is gooey. I love it and by extension you. I’m looking forward to staying up very late tonight despite having work tomorrow to thoroughly stalk every post here. haha they really do like to fold in half if you make them too big – I find it easier to flip them when they’re made with only 1-2 tbsp of batter, and make mini pancakes, they should turn out less soggy that way too 🙂 I LOVE putting shredded coconut on top of them, so goooood! These look SO good! I’ve tried the whole banana egg pancake thing and they have NEVER worked out for me. I hate bananas, can you taste them? Is it like banana bread? This is a fantastic low oxalate breakfast. I see so many possibilities for this for other meals as well – THANK YOU so much for posting this!!!! Spotted this post a couple of days ago and just made and devoured it. They’re not really anything like regular pancakes in terms of flavor or mouthfeel but they’re so satisfying and delicious. I ate it with a couple slices of turkey bacon and a little jam on top. Wonderful! These are genious! I just made them using 1/2 mashed banana, the egg, baking soda, cinnamon, and a 1/2 T of sorghum flour to give them a little structure. Turned out great. What are the nutritional facts on a serving of these? That GIF is ridiculous!!!!!!!!!!!! I’m dying. Amazing. Hello, new favorite blog. We tried these this morning and they were an epic fail. Weird and wet and they tasted more like a banana omelette than a pancake. Even after several tbsp of tapioca and potato flours to try and save them they were still rated only a C on our pancake scale – edible but just barely. I love the idea of them but could not get them to work. If anyone has ways they modified them to make them work I would love the feedback! First let me say that I am a pancake snob, Pancakes are my favorite food and I’d rather not eat than eat a not PERFECT pancake. I was skeptical since there isn’t any flour but since I am trying to lower my carb intake but missed my pancakes I hought I would give it ago.OMG these are amazing and no syrup needed. I added cinnamon, vanilla, and a little cocoa powder. I also cut the egg down to 1 and used some egg whites. I know this kills the whole 2 ingredient idea but its still low “bad carb” clean food. My husband who hates bananas and pancakes liked them. This has totally opened my mind. I am going to try to make a small cake next weekend with this base and maybe a little almond flour. Just tried these. AMAZING! I put some chia seeds, vanilla extract, and baking powder in with the two ingredients. Yum. I tried this recipe and ended up making banana scrambled eggs. Not sure what I did wrong… Any tips? Really impressed with how the pancakes turned out! I was a bit leary at first, but they are great! Mine turned out to taste slightly dry though…. any ideas? I might try to add a little almond milk next time…. Wondered if these would work with chia eggs? I don’t eat eggs, currently. Wondered if you are anyone tried that. I may have to experiment. Thank you for the lovely idea. I have come across flourless ones before but always with egg. Seeing the simplicity of it here I will experiment :). I was wondering the same thing. We do grain free, and egg free… So I was also looking to experiment. I would love to hear if you find something that works! On a scale of 1 to 10, there are a 100! An absolutely perfect recipe! Not only are these extraordinarily delicious (I added the baking powder, 2 T of almond flour, a pinch of coconut, and about 1/3 cup of blueberries), but they are so incredibly easy to make. They require nothing on top of them. I have added these to my permanent recipe list. Thank you so much for sharing! For those who got “banana omelet” instead of pancakes, did u mash the bananas thoroughly, or, better yet, use a food processor/blender? Preach it! 😉 thank you!! Has anyone successfully tried an egg substitute for these? 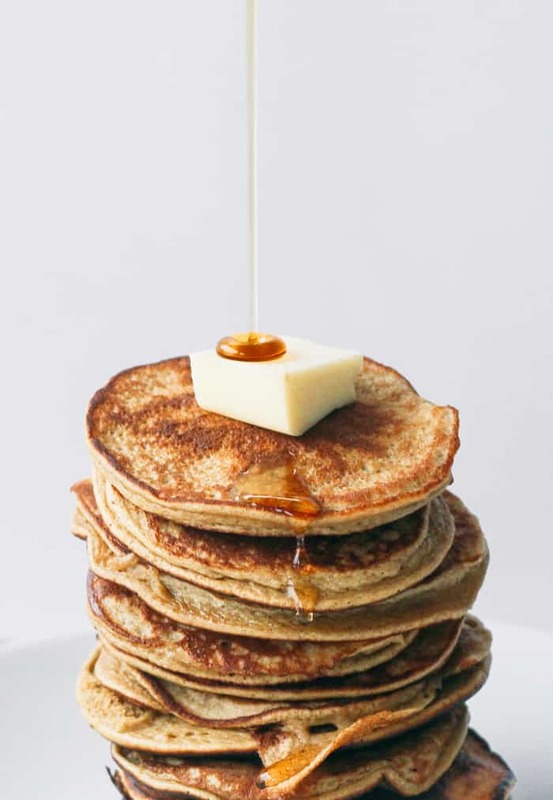 I know you can use flax, corn starch, applesauce etc in original pancakes, but is there something you could use in the place of the egg in a recipe like this? I need grain free and egg free. Maybe grinding nuts or something? Thanks! I haven’t tried substituting with this recipe yet. However I use chia eggs in baking (either while or ground depending on what I am making). It is the same as flax, 1tbsp to 3 tbsp water. Perhaps mixing turbine mixture with the banana would work. I havent done it yet but thought id share the idea with you in case you want to try it. Has anyone tried these in a waffle iron? I rarely comment but OH MY GOD. I just made this for dinner. I had zero expectations (no offense but it’s just that so far all healthy pancakes I’ve seen include protein powder and I haven’t found any I like so I don’t have any). I added all the extras as I was so happy to have all the ingredients at home for once (I don’t live in the US so I don’t always have all the ingredients available to me) and they turned out AMAZING. I swear, from the noises I made my boyfriend thought I was doing something else in the kitchen if you catch my drift. I cannot thank you enough. This was totally spur of the moment ‘I want breakfast for dinner, I just worked out, give me something’ but BOY did it DELIVER. So incredibly good. I’m treasuring this recipe. I just made these pancakes, and mine turned out more like cow chips than pancakes. I used the baking soda, 2 eggs, and 1 banana (and some sugar-free cocoa powder and coconut). Perhaps I needed to add more banana? Any ideas? Thanks! Do you know if these work with egg whites?? If so, how many per banana?? I was very hesitent at first. And when I made the batter I was even more hesitent because it wasn’t thick. But when I finally ate them OH LORD HAVE MERCY! These are so freakin delicious! I couldn’t move for a minute! Thank you for the recepe! Also is you instagram name the same as your blog name? Thanks! 🙂 glad you liked them too!! How on earth do you make these without them falling apart??? Just made these for my super picky little sister and she approves! Lol great recipie. Omg literally just made these and they are amazing! Definitely add the baking powder 🙂 makes them nice and fluffy. I think they actually tasted better cold than warm! can you use the mixture to make muffins? I used a food processor and a pinch of baking powder. These were INSANELY hard to flip, I had to make them no bigger tan a tablespoon size, and still I had to lift them very carefully wiggling the spatula. Otherwise they ended up teared or in the best case wrinkled. The taste was okay, very sweet, as someone said earlier – they tasted like banana omelet, a rather odd combination for me. And yes, texture was very delicate, but more like soggy and easy to tear than fluffy. They may be healthy and overall they aren’t too bad taste-wise, but I won’t be making them again – too much hassle and I’m not even gf. I made these with 1 and a half bananas, 2 eggs and 1/8 baking powder. My pancakes came out so liquid-y. I would go to flip them and all the liquid at the top would just overflow and fall right out. What did I do wrong? Do you think its possible to cook this recipe as a muffin? I am no vacation right now with very minimal ingredients so this seemed an appropriate use for the half banana and egg that remained in my fridge. I made the basic recipe with no adjustments other than adding a pinch of salt. The batter was quite runny but I went with it. On my second pancake I added about a teaspoon of peanut butter which made it a smidge bit thicker but not much . The end result was some kind of weird but good sweet little pancake bights, yum! Thanks for the recipe, would be great on school mornings! First one was a mess but tasted delicious . Just finished 2nd one and that one did work. It’s looking good! really? oh wow I didn’t realise that COWS laid eggs. Dayum. Thanks for the recipe. I agree that these tasted a lot like french toast (which happens to be my favorite breakfast food!) since I added cinnamon and vanilla. But my results were nothing like the photograph. I did add the baking powder, but yet they were still pretty flat. Does the version in the photograph include any other ingredients that would have made them fluffier? Oh, and my 16 month old daughter gobbled these up!!! Just made these and they tasted good, but texture was not fluffy. This was super simple as I just dumped frozen bananas, eggs, baking powder, and 2 tbs of PB2 into a bowl and mashed everything with a cocktail muddler. Didn’t get much of the peanut flavor, but loved the banana flavor. Thanks for the recipe. Made these this morning and all I can say is F*A*N*T*A*S*T*I*C!!!! Just made these in less than 20 and added some oats and they’re amazing! Thank you! I have struck out three times! What am I doing wrong…I cannot flip if golden brown and I can flip if burnt! YIKES! They ARE very fragile. You may want to add a pinch of flour to make them more ‘sturdy’. For me they worked out when no larger than 2,75 in (7cm) in diameter. I tried these this morning! Yes the flavor was good but the texture not so much.My pancakes looked nothing like yours mine puffed up wonderful while cooking as soon as I put them on my plate they went extremely FLAT 🙁 Any idea what could have went wrong? Been hearing about the banana+egg pancakes on fitness social media but was SUPER skeptical that they would taste anything like a pancake. Made these just now with all your suggested add-ins (used coconut flour instead of PB2 because I have it lying around) and it turned out wonderful! I think the cinnamon & the baking powder additions really give it that pancake fluffiness/texture and smell! And because it was healthy, I smeared some butter & syrup on for good measure haha. I loved these…added 2 Tbsp coconut flour, 1/8 tsp baking powder and 1/4 tsp cinnamon. My pancakes were a hot mess !! How did you get them to come out so perfectly? They were delicious, but not picture worthy. Could these be made with squash/pumpkin and gelatin so it’s AIP/sugar free? These were…odd. Like previous posters, my batter was extremely runny and all I got was a flimsy weird banana-omelet thing. My toddler ate them but what does he know. I think I’ll stick to regular pancake recipes. I made these but trying to flip them was a complete nightmare. The pancakes were SO soft (too soft), when trying to place the spatula underneath the pancake, the pancake would just squish up together, or lose its whole shape.. Maybe it’s because I didn’t really measure out the bananas, I estimated 1/4 cup of frozen bananas, but measured the desiccated coconut, frozen blueberries, baking powder and chopped walnuts. Any idea what went wrong here? I tried them. They tasted exactly like the ingredients…a banana omelet. Some may like it, but mine weren’t very tasty. Stumbled upon your recipe but have a question, with a severe banana allergy what option would be the best replacement for that? Thanks. I tried these but they would not flip! They would collapse and break apart! Any suggestions on how to fix that? Just made these and they were really incredible! I agree with your comment about the baking soda. I added cinnamon and a scoop of vanilla protein powder for a higher-protein snack. Thank you, I will absolutely be making these fluffy treats again! I wonder if this recipe can be used for waffles? 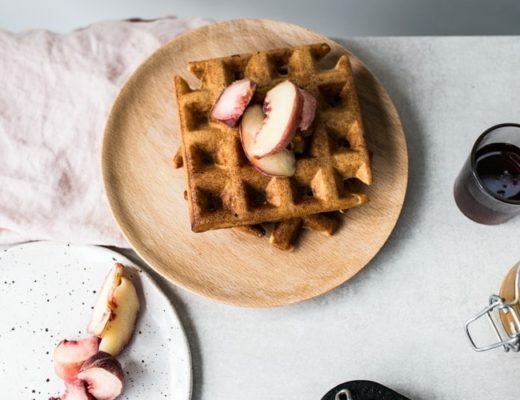 Have you tried waffles or suggest a batter that would work for waffles that is grain free? I’ve used it in a waffle iron successfully. I didn’t care so much about how fluffy it is so you might want to experiment with adding more baking powder. Also, for a little more substance, you could try adding arrowroot starch and organic corn starch. I do this with my pancakes and it gives it more of a cakey texture.That would still make it grain free. I made them this morning, the kids ate them as I removed them from the pan! I used 1 egg, 3/4 of a banana, a little baking soda, and cinnamon. I added little chunks of banana to the pancakes in the pan and it made them sweeter! I also used a fork to flip them and it helped make the flipping easier. My firstborn pancake tasted more like omelette than a pancake. Whatever, this recipe leaves a lot of space for experiments, so I’ll surely keep trying for better result! I made these using fresh pear purée and adding in the peanut butter and baking powder. I wasn’t sure if the pear would work but it did! Thank you for sharing this with your insights and additions. Awesome!! Sorry folks but it is not DAIRY free if you use an egg. LOL WHAT?! You cannot be serious! Wonderful, thank you! I made them with 1/8th of teaspoon of baking powder and a heaping tablespoon of natural peanut butter. Absolutely delicious. Has the texture of a dense pancake. I also love that these don’t leave me with that heavy feeling in my belly that regular pancakes give me. Very tasty and I will definitely make again! These pancakes are not dairy free if you use eggs. Why are you not posting my comment??? I did post your comment and replied to it. You can see it posted above. Your comment was indeed posted, and eggs are STILL not dairy. Waffles! I love that idea! Did you use baking soda or baking powder? Just curious…. I love it! I made them today morning, my kids and I love it. Would love to see more of it, thank you so much for sharing.